Easy, peasy knitting baby sweater patterns are great to have at hand for the baby shower gift that can be made in just a few nights. Nothing makes more of a hit than something handmade. Infant and toddler cardigans and jumpers take no time at all, and this little baby cardigan knitting pattern has always been a favorite. 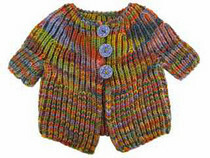 The "ribbed knit baby jacket" is knit in one piece on a 5mm or US size 8 needle and only has the one buttonhole. This little pink girl's sweater pattern is written to knit in Debbie Bliss Aran, but it can easily be finished with any yarn, organic cotton or washable wool blend, with a gauge of 4.5 st = 1 inch. Change the colorway and the buttonhole placement and knit it for a boy. Sizes available 0-24 months. My own version of the ribbed baby jacket is here. The pattern is a free download and print out, archived now at Wayback Please be patient, it takes a few seconds to load. Crochet amigurumi animals free patterns, dinosaur and puppy. The Baby Brioche three-button cardigan is knit from one skein of heavyweight (DK) sock yarn with little or no seaming and fits up to 12 months. New mommies are always happy to get larger sizes when babies grow so fast. The baby sweater pattern is free and you can download it here. rainydayknits. 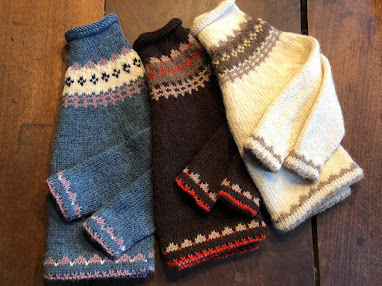 There are more patterns for sale on rainydayknits, please have a look. This little baby waistcoat vest crochet pattern is really so versatile, available from Garn in an abundance of languages, 14 in all. 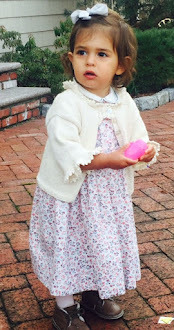 The pattern size range is equally grand, 0-3 months up to 3-4 years for toddlers. You can find the baby waistcoat pattern link along with two other crochet baby sweater patterns suitable for boys or girls here. Also, check out this link for a hat and sweater set, Fancy Lace Bonnet and Sweater set.